Boys pass rubble and destroyed buildings on their way to a nearby private school offering basic lessons, in the city of Maarat al-Numaan, Idlib Governorate. The fighting in Syria “is not over” and neither is the “marathon of suffering” for millions of people in the war-torn country, a senior aid official at the UN said on Thursday. Jan Egeland, Special Adviser to the UN Special Envoy for Syria, was speaking to journalists after a scheduled humanitarian task force meeting in Geneva. 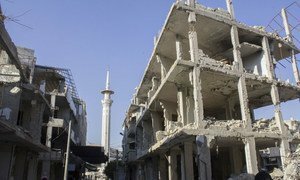 “It’s not over, and that’s what I fear, people think it’s over,” he said, amid reports that “tens of thousands of people” from Rural Damascus were preparing to evacuate to Idlib in the north-west of the country. Mr. Egeland’s comments come amid ongoing aid-access challenges, in many areas of Syria, linked to mass displacement and acute needs caused by more than seven years of war. One year ago, well over four million people lived in so-called hard-to-reach locations where aid access was extremely unreliable, and hundreds of thousands more were trapped by surrounding forces. According to the UN Office for the Coordination of Humanitarian Affairs (OCHA), displacement in some parts of Syria is as high as it was at the beginning of the crisis. OCHA’s records indicate that for every person who returns home voluntarily, another three people are newly displaced. Areas of particular concern include Afrin in the north, the former ISIL stronghold of Raqqa, as well as Eastern Ghouta outside Damascus and Yarmouk in the south of the capital - where the UN has highly-restricted access. But Mr. Egeland said his “worry number one” was Idlib, which is already home to more than two million people. “They are living out in the open, they are living in congested displacement camps…crammed in collective centres,” he said. “They arrive at 2am, you know, sort of every night now, just to find that they can hardly get a bed anywhere offered by completely overwhelmed humanitarian actors. So we cannot have a war in Idlib,” he implored. Amid reports that armed groups are continuing to strike what Mr Egeland called “bad humanitarian agreements” to allow civilians to leave several conflict zones including the besieged Shia towns of Foah and Kafraya in the north-west and Yarmouk south of Damascus, he said it was important that people went to a place of their choosing. Mr. Egeland also expressed concern for the 40,000 people living in displacement camps near eastern Ghouta – previously home to 390,000 people - amid a reported lack of freedom of movement for civilians, particularly men. The veteran aid chief also defended the value of the UN-coordinated “deconfliction system” which offers protection to humanitarian locations whose location is communicated to warring parties. More than 660 sites had now asked the UN to transmit their coordinates to Member States whose militaries are operating within Syria, Mr. Egeland said, and more than 500 of those requests had come this year alone. “I’m surprised really by those who say they really want to help protect medical facilities, that they are questioning the whole value of trying to get a deconfliction system up in the Syria war, like we have it in Yemen, we have it in Afghanistan, we have it in Mali and many other conflicts,” he added. Despite a United Nations Security Council demand to institute a 30-day ceasefire across Syria, airstrikes, shelling and ground offensives have intensified in Eastern Ghouta, Secretary-General António Guterres reported Monday, warning that the conflict is entering its eighth year with the “grimmest” reality on the ground.